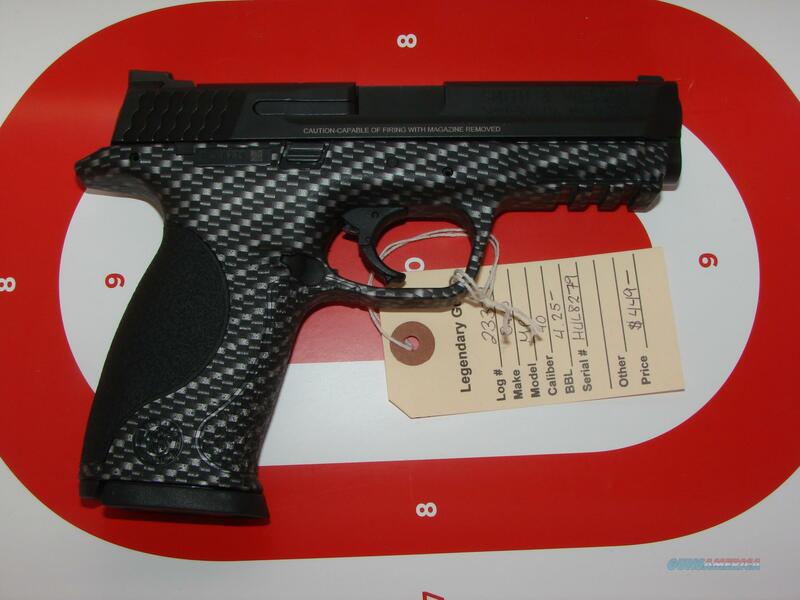 Description: S&W MP40 in 40, with 4.25" barrel, carbon fiber finish, 3 dot sights. Gun is brand new, never fired has been on display and may show some cosmetic wear. Legendary Guns Inc., an FFL dealer, was founded in 1988 in Phoenix Arizona to meet a growing demand for quality new, used & antique firearms and accessories. Since then we have consistently grown to become one of the largest stocked gunshops in Arizona. We also have a large inventory of Cowboy Action Shooting guns and accessories and we also support SASS. Our policies are: We don't engage in internet trades. We take all major credit cards or Bank Checks.We DO NOT charge extra for credit card payments. We Try to ship the same day your FFL arrives assuming payment has been secured. We do not ship outside of the USA. We charge $35.00 shipping. In the Continental USA, Alaska and Hawaii are extra. We allow a 3 day inspection period starting from delivery date. We do not reimburse for shipping charges either ship to or ship back fees. A 15% restocking fee may apply on all returns. Please call 602-242-1195, ask for Internet sales, for details and questions before purchasing. We aim to please and are happy to answer any and all questions to avoid returns and disputes. Hours of operation: Mon-Fri 10-6, Sat 10-5, Sunday closed.